As summer comes in and we start to shed our winter wear, looking forward to summer holidays and the beach-body, is it any surprise that you start to think again about losing those extra pounds. Einstein said that insanity is doing the same thing over and over again and expecting a different result and yet how many times do you go on another diet and expect to lose weight once and for all. Most of my clients, when they finally come to seek help, will be able to rattle off a long list of diets they have tried in the past, how many pounds they lost on it, and how much heavier they were a year later. Over the years their weight creeps up and up, but they are still sold on the idea that the next diet will work. Perhaps this is our modern obsession for the instant result? I want it and I want it now? With fast food, 24hr shopping and the credit card we have become used to getting what we want immediately. Or perhaps that instant gratification is concealing a bigger problem, ‘in the moment’ it makes you feel good (never mind that you might regret it later). With weightloss you need to be looking at the longer term, after all the weight didn’t go on overnight, in fact it crept on so slowly that you probably didn’t notice until you found you had to buy clothes in the next size up, or you saw yourself in your holiday snaps and didn’t like what you saw! Long term weightloss is about small changes that, over time, make big differences: making better food choices, moving a little more, reducing portion sizes a little at a time. Ongoing motivation is the reason most people don’t approach weightloss in that way. It is so motivating to lose a few pounds in a week or to have people notice you have lost weight but in the long term these forms of motivation don’t keep the weight off. If you manage to lose all your excess weight, people will notice, they’ll say how amazing you look…but after a while they’ll get used to it and stop commenting – and they certainly won’t comment when you start to put it back on again! Having a healthy, fit, body is a pleasure that has to come from within. It is the joy of self-esteem, loving yourself enough to feel you’re worth it, feeling that the world, and especially those you love, will benefit from you having a longer, healthy life and that you don’t need ‘stuff’ to give you value. These intrinsic goals are scientifically shown to improve outcomes, above the goals of looking better or dropping a couple of dress sizes. At the end of the day, you spend more time in your body looking out than you do looking at yourself (even when you really like what you are looking at in the mirror!). When you find that true self-esteem within you losing weight won’t just be about how you look, it will be about expressing the wonderful, unique person that you are with energy, health and vitality! Whatever we may believe we want; a new car, a beautiful home, a luxury holiday or a loving partner, what we really want and what we believe these things will give us is…Happiness. But what if Happiness was already your way of being in the world? What if you were just happy, without a reason? Studies have shown that we all have a set level of happiness and acquiring the things we think will make us happy, will actually only raise our level of happiness temporarily. We soon adapt to these new good things and our happiness level reverts to the previous level. In fact, once the basic needs are met, it doesn’t seem to make much difference to your overall happiness whether you are poorer or wealthier. You might now be thinking that there is no hope of becoming happier, but recent brain research has provided a key that can help unlock your potential for greater happiness – neuroplasticity. The previously long held ‘truth’ that your mind is a construct of your brain and past experiences has been turned upside-down because they have discovered that your mind creates your brain structure and by thinking differently, you can actually change your brain. 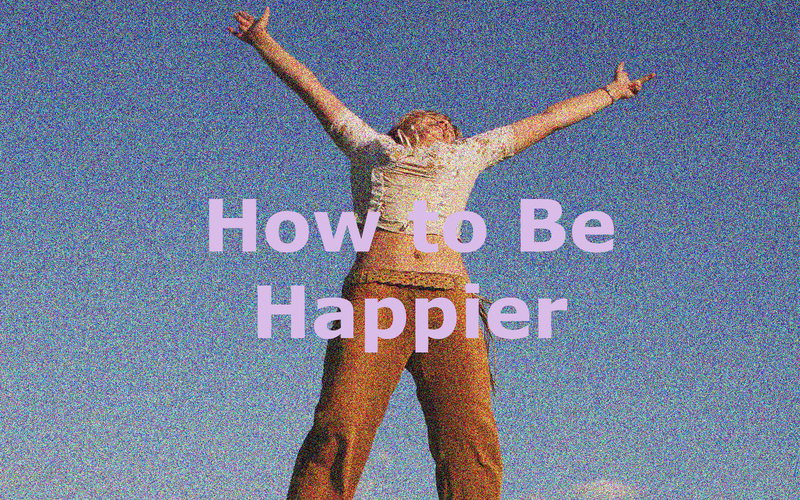 The process of increasing your happiness is actually quite simple, even though the practice is not so easy. First you need to look at your past and future; if you hold on to negative emotions about the past such as anger or sorrow, that part of your life will continue to affect you into the future. If you feel emotions like fear or worry about the future those feeling will colour everything you do in the present. The first step then is to let go of the past (easier said than done?) which requires looking at it from a different point of view; in NLP we call this ‘reframing’. Consider, for instance; ‘Because this happened in my past I am now a more ………… person’ or ‘… I learnt to do/be………….’ The more positives you are able to find in a situation the more you can feel gratitude for even the worst experiences. Negative feelings about the future exist completely in your imagination. The only foundation you can have for those ideas come from past experiences. Clearly there are certain things that are highly likely to happen – if you get to work late for the tenth time you are reasonably likely to lose your job but perhaps you would be better finding a job that you like enough to get there on time! And the Present? The first secret here is to actually be present. When we are happiest we are not thinking about what we look like, what others think of us or what we are going to do later; we are engrossed in the activity of now, whether that is work or play. Another secret to happiness is Contribution. Helping other people makes us feel good about ourselves, more empathic and more useful and less self-absorbed. Studies with sufferers of Depression found that when they got them helping other people their depression lifted quicker. Being happy makes you more creative, more productive and more successful with relationships so bring the Joy into your life. © 2019 Deja-View | Hypnotherapy Devon.